The most recent "POP!" moment I've had came with this cupcake made from vintage buttons. I'm kinda stuck on how to finish it. First of all, I'm not sure if it'll just be a random fun ornament-y thing?...or a charm?...Or what? The cupcake measures 1 1/4" from the top button to the bottom one. The loop is 5/8"--which is WAY too huge, I know. I'm not a jewelry person, so I don't know what to do about that really sharp, stabby wire at the bottom of the cupcake. Seriously, it's a weapon--it's very sharp! I took a strand of wire &, obviously, fed it through the top of each button, on 2 sides, & was left with 2 wires poking out the end (the bottom of the cupcake). I just twisted the wires together with my pliers & snipped off the excess. I can totally take out the wire & start over. I really have no idea what I'm doing, so any suggestions would be MORE than welcome! I like your cupcake ! There is no way to bend the wire back under the last button? I have seen some neat wire wrapping where you twist it around it's self to make a stopper on the bottom. How about post a thread on Etsy and I know those fabulous folks there could give you an idea how to finish it. I like the ornament idea, maybe in a grouping? Very cute! I love the cupcake! I'm a huge cupcake fan. It's my latest obsession. Great idea! I'm a recent cupcake fan also! I am addicted to all things "cupcakey"! Thanks katydiddy! 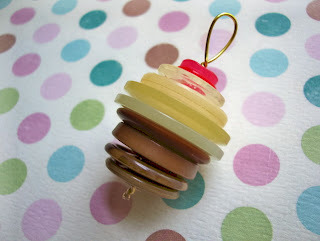 These are so cute... you have inspired me to play with our button bin more... 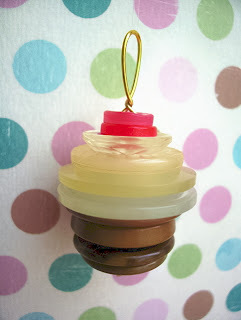 I'm thinking of using either an old spool or a cork for the base of the cupcake... Thanks again for the inspiration... My little crafters are going to love it.